This guide covers how to visit Alcatraz, what you will see, what to do if Alcatraz tickets are sold out, and which Alcatraz tours are the best. Alcatraz is an incredible place (#2 on our top 10 things to do in San Francisco). Do not miss this gem (and Free Tours by Foot) during your next visit to San Francisco! While several entities are authorized to offer Alcatraz tickets for sale, there is only one company authorized to visit Alcatraz Island, Alcatraz Cruises. Though several boat tour companies offer guided commentary on the island as they cruise past it, none are allowed to dock there. Private boats are also prevented from landing on the island. There are 5 ticket/tour options. We list 4 in the next section below. Click here for a detailed explanation for the night tour ticket. NOTE: Free Tours by Foot does not offer tickets to Alcatraz Island. Please follow the links on this page for help organizing your tickets. You could purchase your tickets through Alcatraz Cruises or with any of a number of sightseeing tour companies in San Francisco that offer Alcatraz Island as part of a combination ticket. The National Park Service provides a Cellhouse Audio Tour that is included in the cost of your ferry ticket. At your own pace, you can follow in the footsteps of former prison guards and inmates. This tour is very well done and worth the time. The Cellhouse Audio Tour is available in English, Spanish, German, Mandarin, French, Italian, Japanese, Korean, Dutch and Portuguese. The tour is also provided in Braille in English. Beat the crowd, be the first one on the island during the less busy, Early Bird Tour. Includes ferry ride to and from Alcatraz (20 minutes each way), a self-guided audio tour of the prison lasting 45 minutes, and time for self-exploration of the grounds. Most guests typically spend about 2 hours on the island. Departs from Pier 33. Alcatraz is one of the most popular attractions for tourists visiting San Francisco, so it’s no surprise that it comes highly rated on TripAdvisor. The Early Bird Tour is ideal for early morning risers as it allows visitors to beat the crowds and still have a free afternoon to pack with other fun activities. In fact, the Early Bird Tour is so popular that as of Spring 2018, there are only 4 and 5-star reviews written about it. TripAdvisor Rating: 4.5 stars. The Day Tour is the same content as the ‘Early Bird’, but with higher attendance rates and 12 departure opportunities. You won’t be alone on the island as you self-explore during these times! Identical to the Early Bird Tour but with a later start time, the Day Tour is also very well liked by most guests. Negative reviews are rare and usually come from guests who found the island too crowded. If you’re worried about this, opt for the Early Bird Tour instead! TripAdvisor Rating: 4.5 stars. The Behind the Scenes Tour offers guests a much more intimate look into the history of Alcatraz. The tour includes everything offered in the Early Bird and Day Tour, such as the ferry ride to and from Alcatraz (20 minutes each way), a self-guided audio tour of the prison lasting 45 minutes, and time for self-exploration of the grounds. In addition, it offers a personally guided small group tour that lasts approximately 2 hours and takes guests “off the beaten path” and “behind the scenes” of Alcatraz. Also included are special programs and presentations offered by staff as part of the Alcatraz Night Tour, which lasts approximately 1.5 hours. This is advertised as a “physically strenuous tour” that lasts between 4-5 hours in total. Alcatraz Cruises suggests that guests eat before the tour, as there is no food service on Alcatraz. Departs from Pier 33. Children (under 12) – not applicable. This tour has a minimum age of 12 due to its lengthy duration. This is the perfect tour for those hoping to really maximize their time on Alcatraz. Though reviews of this tour are limited, they are all extremely positive and praise the tour for offering such thorough insight into the history of the prison. A really fun tour, but be sure to bring snacks as it’s a long day on the island and there are no food and beverage facilities. TripAdvisor Rating: 4.5 stars. This is a combination tour that visits 2 of the most well-known islands in the Bay Area: Alcatraz and Angel Island. The tour includes the ferry ride to and from Alcatraz and Angel Island, a self-guided audio tour of the prison lasting 45 minutes, and a one-hour narrated Tram Tour of Angel Island. The total tour lasts approximately 5.5 hours and departs from Pier 33. Though only offered seasonally, this tour is also extremely popular with guests who want to experience Alcatraz but also witness the beautiful scenery available on Angel Island. Many reviewers write that they opted to bring a picnic lunch to enjoy on Angel Island after their Alcatraz visit — making for a perfect afternoon! TripAdvisor Rating: 4.5 stars. There are 3 options to purchase tickets to Alcatraz Island. There is also a chance for standby tickets. First, you can purchase tickets directly from the Alcatraz Cruises website. This is the most common way to purchase. Unless you are planning on also purchasing a bus, bike or boat combo ticket, this is also the most affordable option. We recommend that you purchase tickets about 90 days in advance, as they tend to sell out very quickly during the busy season (summer and holidays). There is also a chance for standby tickets if tickets on their website are sold out. Second, you can also purchase a ticket to Alcatraz as part of a combo package with other tours, such as a hop-on-hop-off bus, popular attractions and/or for a day trip to Muir Woods or Wine Country. Check out our section on Tour Company Combos to learn more. Lastly, you can also purchase from 3rd party vendors near Pier 39. These vendors purchase tickets en masse from Alcatraz Cruises, so be prepared to pay higher prices or purchase their pre-arranged packages (which means you’ll have to buy Alcatraz tickets along with something else, usually a Bay cruise). The Alcatraz Cruises boats depart from Pier 33, on the northern waterfront of San Francisco. NOTE: All boarding members must have an ID present to board with their ticket. Regardless of which form of transportation you choose to get here, we recommend using this Google Maps link for directions to the pier. In our opinion, this is the easiest way to get to Pier 33. If you are starting your trip anywhere on Market Street or along the waterfront, the streetcar can take you right to Pier 33. Just get off at the Bay Street Station. See our post on how to ride the streetcars to get more information on schedules, maps, and prices. There are three Muni buses you can take. Click on any of these links to go to a route map and schedule for each bus. Note: If you have to park, be sure to arrive early! We would suggest arriving up to 45 minutes before your scheduled departure. Parking can be extremely difficult along the waterfront, especially in the busy spring and summer months. You don’t want to miss your departure time, so be sure to give yourself enough time to find parking and walk to the dock. The ferry ride takes about 20 minutes each way. The audio tour is a 45-minute self-guided tour. The biggest variable in how long your journey will take is your exploration of the island. While on Alcatraz, we would encourage you to take one of the many ranger-led talks in the prison dining hall. These talks usually run about 20 minutes and cover topics as wide-ranging as escape attempts, the types of plants on the island, and the history of the island itself. In general, we would recommend that you plan about 2.5 hours for the entire trip. Alcatraz Cruises offers night tours of the island, departing twice a day, Thursday through Monday. Departures for the night tours leave from Pier 33. Get more in-depth analysis and review overview on our Alcatraz Night Tour page. Below is a good summary of this information. Also, be sure to check out our post on other things to do at night in San Francisco. This tour offers more features than the Early Bird Tour and Day Tour for a little extra money. On the night tour, you receive a narrated boat ride to the island to learn more about the history of Alcatraz, before it was a prison. You also receive a guided tour from a specially trained National Park Ranger. Additionally, Alcatraz Prison hosts special talks and lectures during the evening tours that are not offered during the day. The 6:30 pm (18:30) departure time limits your time allowed on the island. The last ferry leaving Alcatraz departs at 9:25 pm (21:25). Learn how to purchase the night tour. The Night Tour of Alcatraz is especially highly rated as it includes perks not otherwise included in the daytime tours. For example, visitors of the Night Tour comment on the added pleasure of seeing the skyline and two bridges on a clear evening as they return to the mainland, as well as visiting the hospital and cell lockdown. Though this is not a ghost tour, some guests report that they found the Night Tour to be a bit creepy, especially when visiting the solitary confinement area. However, most seem to think the experience is more educational and interesting rather than scary, so it really just comes down to personal preference! TripAdvisor Rating: 4.5 stars. Due to the island’s huge popularity, Alcatraz Cruises advises visitors to book their tickets 90 days in advance, especially during high season. However, for those who aren’t able to secure tickets ahead of time, there are a few last-minute booking options. This is the option if your time is worth more than your money. Several companies sell combo tour tickets that combine Alcatraz with other tours, such as a hop-on-hop-off tour, or an activity, such as a day trip to Muir Woods or Napa Valley. This is a reliable option, as many of these companies buy tickets in bulk to have certainty for their guests. Therefore, when Alcatraz Cruises is sold out, these companies may not be. Check out our combo ticket section to find out more. Alcatraz Cruises update their website several times a day to add tickets that have been canceled by guests. Be sure to check their website periodically to see if your preferred dates open up. 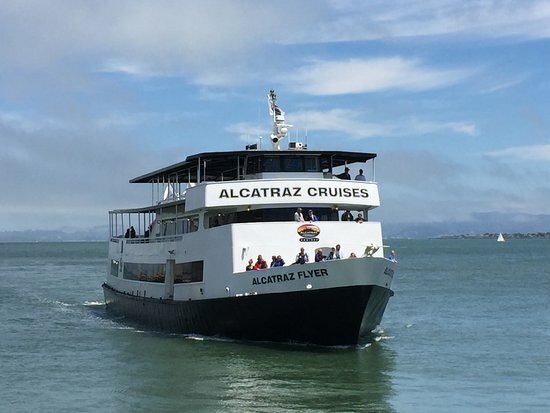 Though their tickets are often sold out months in advance, Alcatraz Cruises sets aside a limited number of same-day tickets that are available on a first-come, first served basis at Pier 33. The box office opens at 7:30 am, though due to the limited availability, people line up early to secure tickets. So, this option is a gamble. The maximum number of tickets sold to one person is just one, so be prepared to have everyone up and standing online really early the morning that you would like to go. Government-issued photo ID is required to purchase and pick-up tickets. Guests can also get standby tickets for the night tour by lining up before the box office opens at 7:30 am. You are then given a standby ticket and told to come back right before 5:55 pm and 6:30 pm departures to see if there are any no-shows. The standby tickets are honored in the order by which they were purchased in the morning, from first to last. Due to its popularity, a very limited number of tickets are available via standby every day. This option is also a gamble, as you are not guaranteed tickets, even if you get standby status. Tickets for the night tour are usually available on StubHub, but you will pay more for these. NOTE: Purchasing tickets on StubHub is apparently against the no re-selling rules, but considering that there seem to be no complaints online, it doesn’t appear to be enforced. StubHub also guarantees refunds for tickets. Combo packages are actually one of the easiest methods for getting your tickets to Alcatraz Island. You can purchase tickets to the island separately, but they are very popular and can be difficult to obtain. Alternatively, a combo tour helps guests secure Alcatraz tickets, while also enjoying other popular sites. Below, we list 3 affordable options. There are many more options to choose from if these don’t suffice. TIP: If you are thinking about a tourist combo ticket or pass, you should read our comparison post to help understand which one, if any, is best for you. Even though Alcatraz Island Tour tickets are not included, some include boat trips around the island. Big Bus and City Sightseeing combine their hop-on-hop-off bus tours of the city with a ticket to Alcatraz and offer the best value for most readers. Extranomical Tours and Tower Tours, on the other hand, combine other day trips such as Muir Woods and Wine Country with an Alcatraz ticket. Learn more about combination tours by checking out our pages on day trips to Muir Woods, Yosemite, Sausalito, Sonoma Valley, and Napa Valley. City Sightseeing offers an Alcatraz Combo Tour which includes a 3-day hop-on-hop-off tour featuring 4 different loops: The Official City Tour, Downtown San Francisco Tour, San Francisco Night Tour, and Sausalito Bus Tour. The ticket also comes with an Alcatraz Island tour, which includes transportation to and from Alcatraz, a 45-minute audio tour, and free time to explore on your own. This option is very similar to what Big Bus has to offer, though it is a 3-day pass rather than a 24-hour pass. CitySightseeing is a very popular tour company with a fairly good reputation. The quality of the guided commentary varies depending on the driver, though most visitors find it informative and enjoyable. Some guests had trouble hearing the driver due to a poor PA system on the bus, however, most of those comments come from several months ago, suggesting that the problem has likely been remedied. Overall, visitors who traveled with CitySightseeing found the experience very enjoyable and straightforward. TripAdvisor Rating: 3.5 stars. Big Bus Tours offers an Alcatraz Package Tour that combines an Alcatraz Island ticket with a 1-day hop-on-hop-off Big Bus Tour. The latter includes a live English speaking guide, pre-recorded commentary in 10 different languages, drop-off and pick-up at 20 different key landmarks, and a voucher for free ‘pint and play’. Buses are meant to arrive at each stop every 10-20 minutes, making it extremely easy to travel around the city. Additionally, guests also receive a ticket for the Alcatraz Day Tour at an available time. This package isn’t the quite the cheapest package (at least during the summer), but it just may be the best value out there. Big Bus Tours receives lots of positive feedback for their reasonable prices and ease of transportation. While reviewers recommend this package for all of its activities (kid friendly! ), there is a consistent complaint of buses taking more than the 10-20 minutes promised to reach certain stops during high traffic or busy weekends. However, guests who were aware of potential delays find the issue less problematic. We recommend this package for the planner who knows how to use a map and plan a day to maximize time, since hopping on and off this bus to cross the city may eat up a lot of it. TripAdvisor Rating: 4 stars. Extranomical Tours sell several different types of day trips from San Francisco, most of which can be combined with an Alcatraz ticket. Though sold as a package, the ticket for Alcatraz is good for the day after whatever day trip you choose to combine it with. They also offer to pick-up and drop-off at almost any hotel in San Francisco, making the door to door service very convenient. Though some guests complain that the microphone on the bus was inadequate, the infrequency of these comments suggests that this issue has been fixed. TripAdvisor Rating: 4.5 stars. There are many more options to choose from if these don’t suffice. If you are unable to secure tickets to visit Alcatraz or if you are not interested in taking a tour of the former prison, then a boat cruise that passes by the island might be a great alternative. There are several different boats that go by Alcatraz — most of which also feature guided commentary about the history of the place. Blue & Gold Fleet and Red & White Fleet are the 2 major boat tour companies in the Bay Area. Of their many different cruises, the following feature Alcatraz. Escape the Rock – The ONLY boat tour dedicated specifically to Alcatraz. California Sunset Cruise – A 2-hour sunset cruise around the Bay to see the Golden Gate Bridge, Sausalito, Tiburon, Angel Island, and Alcatraz at sunset. Bridge 2 Bridge Cruise – A 90-minute audio tour covering the Golden Gate Bridge, Alcatraz Island, the Ferry Building, Bay Bridge, and AT&T Park. Golden Gate Bay Cruise – Their original 1 hour San Francisco Bay tour with views of the San Francisco waterfront, the Golden Gate Bridge, and notorious Alcatraz Island. To learn more about different San Francisco cruise options, check out our post listing the best boat tours in the Bay, as well as our post comparing Red & White and Blue & Gold Fleet. The video below is a 10-minute sample of the audio tour that you are provided when you arrive at the prison.